Although cryptocurrency adoption might seem like only a matter of time to enthusiasts, that’s far from the reality to those outside the space. This is why every sign of cryptocurrency creeping into our daily lives is another step towards familiarization and adoption - and this is why the cryptoverse celebrate such signs. Cryptonews.com brings you another collection of adoption examples throughout the world, from donations to purchasing your drinks using bitcoins. A great way to incentivize people to use cryptocurrency is to show them how simple it really is. 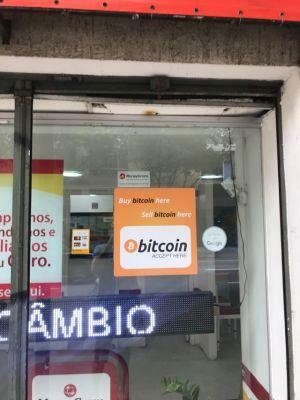 Found in Rio de Janeiro, Brazil - you can both buy and sell bitcoins in exchange for fiat, and pay for goods and services with it. 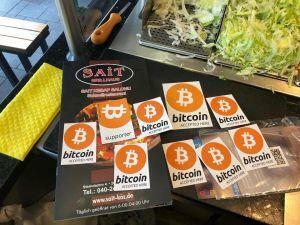 This kebab stand (and shop) in Hamburg, Germany accepts bitcoin! The original Reddit post also implies that they might start accepting other cryptocurrencies soon as well. 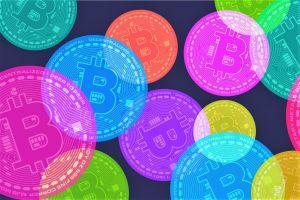 Bitcoin is far from the only cryptocurrency being accepted. 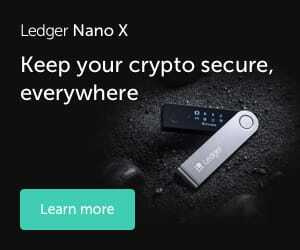 This bar accepts Nano and the payments are instantaneous and without fees. 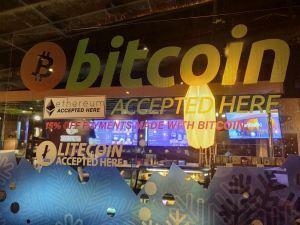 Found in Orlando, Florida, not only are cryptocurrencies accepted here, but you get a special discount of 15% if you use them to pay. 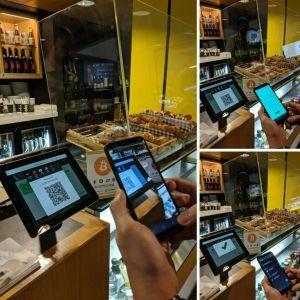 Buy your morning coffee or tea along with breakfast in Brisbane using crypto. Venezuela’s current economic struggles have caused many citizens to turn to crypto. Watch the video to see the original poster buying groceries with crypto. Not only is adoption blooming in the financial sector, but it is also heavily advertised to people. Found in Salta Province, Argentina. UNICEF (The United Nations Children's Fund) France has decided to start accepting donations in Bitcoin, Ethereum, Litecoin, Ripple, Bitcoin Cash, Dash, Monero, EOS and Stellar. You can also “donate” by mining one of the cryptocurrencies offered, where anything you mine goes directly to UNICEF. In Costa Rica, your dream of a bitcoin-paid luxury sports car may not be a simple meme: you can buy a Porsche for bitcoin without batting an eyelid. The ticket vending machines on train stations in Switzerland let you buy bitcoin as well - although you can’t pay for tickets with the cryptocurrency. 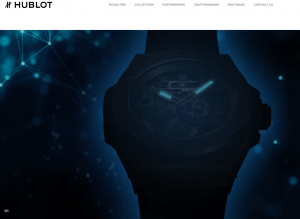 And following the pattern of Switzerland, luxury and crypto technologies, Hublot has announced their foray into the space: a special kind of watch, named the Big Bang Blockchain, a 210-piece limited edition that can be bought with bitcoin. Even China, notorious for their strict stance towards cryptocurrencies and related technologies, boasts the world’s first Ethereum Hotel. As the name implies, it accepts ETH payments. Following a Twitter thread about the Samourai wallet, a cryptocurrency enthusiast joined in to show off a store where prices are displayed in bitcoin. A cryptocurrency related ad during an NFL game? Adoption boost! It may seem funny, but it IS adoption in a way. As one commenter points out, however, it’s a pretty big oversight that Dentacoin is not accepted. 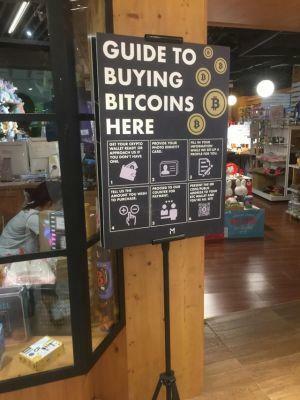 Found in Singapore, not only can you buy bitcoins here, but this sign also explains the ins and outs of the process to everyone. As its title says, the world’s first self order point-of-sale enabled by Lightning Network in Bern, Switzerland. 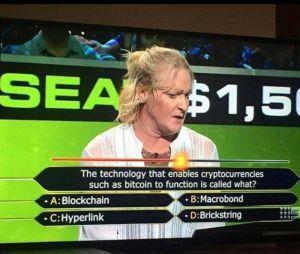 Who wants to be a millionaire? Someone who knows their blockchain, apparently. However, Brickstring sounds like a great name for some other upcoming technology. Not only does this van thank bitcoin (for existing, presumably), but the owner of it showed up in the comments along with a picture of his mom next to the van!